This is what I wore to church today. 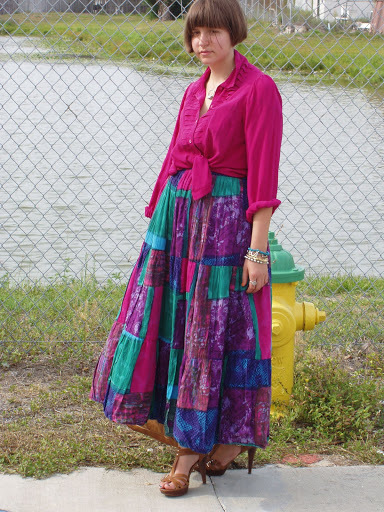 The riotous colors and color blocking print on this skirt is incredible. I wish it went to the floor I guess I need make some more maxi skirts. I love the 70’s and felt like a 70’s prairie girl, hippie and gypsy. I hope you all are having a blessed and relaxing Sunday!!! 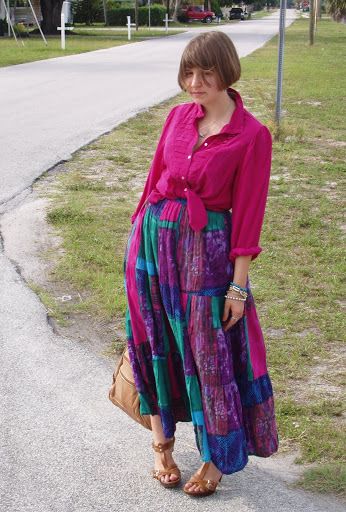 Wearing: vintage cotton maxi skirt from Misred Outfitters with store credit;vintage Escada silk top; small hose clamp worn as a pendant;various assorted bracelets;vintage rings; vintage yard-saled leather backpack; and Marc Fisher shoes. The hippie look looks stunning on you and for the LOVE of GOD… those shoes!!!! I need them in my LIFE!!!! I love the top tied like that!! Very cute! look at the billowing skirt! dont skirts like that make windy days so fun?! i love all the colors. especially that fiery magenta. what a great church outfit! Love the hippie look! And nice skirt! One of your best looks. The skirt and the shoes and actually everything is perfect. I really love the colors of your skirt! thank you so much for your lovely post… your skirts are adorable as well. this one is a real treasure! Laura those colors are fabulous! I'm sure you got a lot of compliments on that outfit! you literally have the best skirts ever! love this one because of the beautiful colors! Such a wonderful skirt, wonderfully pair with a vintage blouse, my dear laura. the colors practically bursts on my laptop screen!